Today on CNBC, Chrysler CEO Bob Nardelli revealed a Tesla-like all-electric performance sports car called the Dodge ev along with three other vehicles operating either partially or entirely on an electric powertrain. The four vehicles are Chrysler's ENVI electric car program, and include an extended-electric Chrysler minivan, a new "gated community" electric called "the peapod" and a Jeep Wrangler four-door. The ev, the first of the four unveiled, not only operates entirely on plug-in power like the Tesla Roadster and appears to have similar performance numbers, also has some striking visual similarities with the Tesla. And why shouldn't it? While the Tesla's built on the Lotus Elise, the Dodge ev appears to be based on the Lotus Europa. We'll have more shortly as soon as Chrysler actually, you know, releases some information on this, but for the moment what we know is below the jump. UPDATE: Hat tip to Popular Mechanics for the live shots from today's reveal! • Recharge on standard home 110/220 current — full charge in four hours on 220 or eight hours on 110. • Eschews the Hemi engine for a lithium-ion battery pack. • 0-to-60 time in under five seconds. • Range of 150-200 miles. 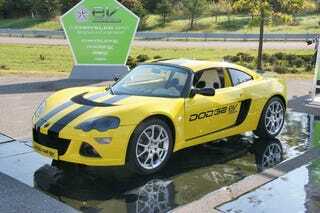 • Unlike the Tesla, based on the Lotus Elise, the Dodge ev looks to be based on the Lotus Europa.